My plancha grilled mini lamb koftas with yoghurt raita dip absolutely hit the spot when I cooked them recently at BBQ demonstration that I was asked to help at. 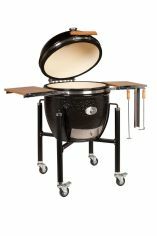 So much so that a crowd gathered around my kamado waiting for the mini lamb koftas to be served. When I first started developing this recipe I struggled to decide how to name it. Is it kofta or kofte? Is a kofta the same thing as a kofte or is there a difference? The answer is simply down to geography and ultimately language. Kofta appears to be more Middle Eastern and the literal translation from Persian is "mashed". Kofte however is Turkish, the correct spelling is köfte and the direct translation is meatloaf or meatball. The base constituents of both are ground meat (usually lamb) breadcrumb and sometimes egg, after that the differentiation comes from the herbs and spices used and the shape. 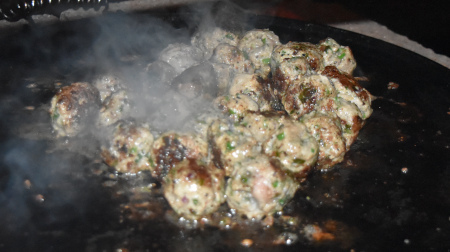 Clearly köfte desribes a meatball and therefore should be spherical whereas other koftas that I have had tend to be more ovoid or flattened, more like a burger. So is it kofta or köfte? To my mind, it doesn't matter that much because I'm not cooking or eating them in the Middle East. I have already developed a recipe for lamb köfte and served it with tzaziki and pitta bread so in some ways that's the Turkish recipe sorted. These mini lamb koftas are going to be in the Middle Eastern style served as a "finger food" appetiser with the classic Indian cooler (raita). Shaped into small spheres, when cooked, I'll simply spear with a cocktail stick and serve with a side pot of raita. The first job is to make the raita because this needs a couple of hours in the refrigerator after mixing so that all the flavours have time to mingle. When done, it's time to start on the koftas. 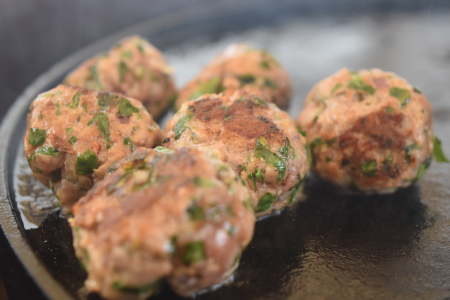 Making the mini lamb koftas couldn't be easier. Just get a large mixing bowl, throw all the ingredients (except the olive oil) into the bowl and get your hands in to give it a thorough mix. Next form the koftas by taking a small amount of the meat mix and forming it into a ball that's about 1cm (½ inch) in diameter. To cook, I used the plancha over gentle direct heat. Interestingly I found it useful to place the plancha on a Monolith wok stand because this gave me a high heat central area of the plancha with the cooler peripheral area. This made it easier to ensure that the mini lamb koftas were cooked all the way through without the outside getting burnt. If you don't have a wok stand to hand then the trick is to use a splash of the olive oil, gentle heat and keep the koftas moving with a spatula. Use a large plate and place a bowl of raita in the centre. Spear every lamb kofta with a cocktail stick and place them on the plate surrounding the bowl of raita. You guests can then take a stick, dunk their kofta in the raita and then savour the flavour.